Vitamins A, C, E and beta carotene, the “antioxidant” vitamins, help protect our cells from damage. But our body’s first line of defense against cell and organ damage is glutathione, the most important antioxidant and detoxifier in the human body. • Neutralizes oxygen free radicals before they can harm our cells. • Combines with Selenium to form the enzyme glutathione peroxidase which neutralizes hydrogen peroxide. • Detoxifies the body by removing lead, mercury and other toxins. • Transports trace minerals into and out of cells. Thousands of studies have been published about glutathione’s essential role in defending our body and what happens when we don’t have enough. Glutathione protects our skin, heart, arteries, immune system, the lenses of our eyes, our brain cells, lungs, kidneys and liver. Our Glutathione Levels Decline as We Age. We depend mainly on our body’s own production of glutathione since nature provides only small amounts in foods. Extreme exercise, radiation, pollution and various diseases lower our glutathione levels. But the biggest cause of deficiency is aging. As we get older we either produce less, or we use it up faster. Studies show depressed glutathione levels even in apparently healthy elderly subjects. Eventually, our levels decline and our cells become more and more defenseless against aging and disease. Foodform®. The First and Only Food Source Glutathione Supplement. Studies show that synthesized glutathione (called “L-glutathione”) is not effective in raising our body’s levels. But our body utilizes glutathione from food. 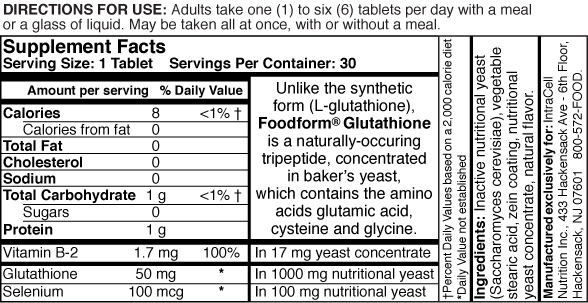 Foodform Glutathione does not contain any L-glutathione. It is concentrated from baker’s yeast cells, one of nature’s richest sources. Each tablet has the reduced glutathione content of over two pounds of fresh vegetables. Plus it contains Foodform Selenium and B-2 to give your body what it needs to produce the essential enzyme glutathione peroxidase. • 100% Whole Food. Unlike synthetic glutathione (L-glutathione), Foodform Glutathione nourishes every cell in your body because it is in a whole food concentrate from baker's yeast, the richest source of natural glutathione. It does not contain any USP vitamins or mineral salts. • Each serving of 3 capsules provides the reduced glutathione content of more than two pounds of fresh vegetables. • Foodform ingredients Proven Effective In Numerous Independent University Studies. Foodform ingredients have been tested by independent researchers in more than 60 university studies which show they are better than regular (USP) vitamins and mineral salts. • The body uses vitamin B-2 and selenium to turn glutathione into glutathione peroxidase, one of the most important parts of our body's defenses. • Does Not Have To Be Taken With Meals. Foodform Glutathione is so naturally-acceptable to your body you can take it all at once, whenever it is convenient. There’s no upset stomach. • Only 5 Calories Per Serving. You would have to eat more than two pounds of fresh vegetables to get the glutathione content of each 3 capsule serving of Foodform Glutathione. Yet it contains only 5 calories per serving. • Easy-To-Swallow capsules are made from tapioca and are vegetarian and vegan.